If these walls could talk! Historic three story corner lot nearly 3,400 square foot Victorian home situated directly across from the Mt. Pulaski grade school. 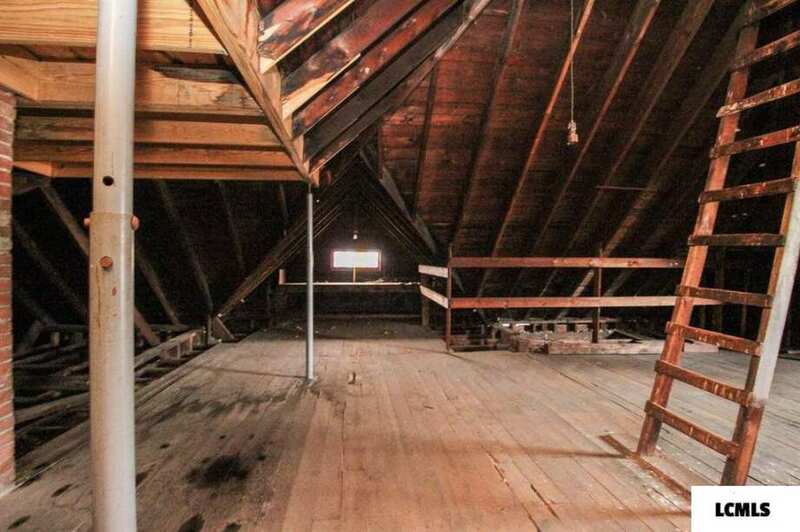 Property is packed with potential and could be an absolute showplace -- here is your winter project! Main floor features a gorgeous foyer host to a stunning beautifully appointed open staircase as well an original front door with etched glass, living room, formal dining room, family room with corner fireplace, den, and kitchen area. Upstairs, you will find a large landing that provides access to a neat exterior front second story balcony, four large bedrooms -- front bedroom boasts an awesome rounded sitting area neatly appointed by abundant windows, and a full hall bath with an older clawfoot tub. Property also features a large basement, unbelievably large and open floored walk-up third floor attic (oh the possibilities! ), front and back staircases, transom windows, front and side covered porches, natural woodwork, several sets of beautiful pocket doors, and a large older two car detached garage structure with a second story that once served as an apartment. This iconic small town Mt. 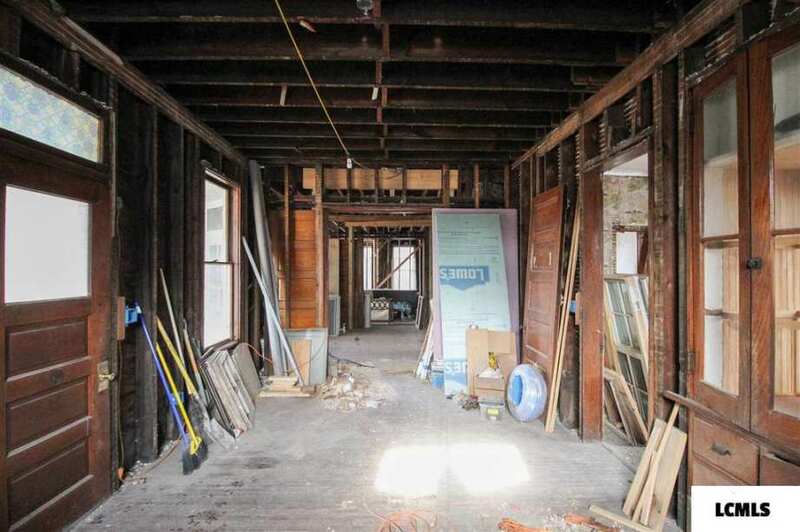 Pulaski, Illinois property has been gutted in various areas and is ready for a new owner to turn it in to the showplace residential dwelling that it once was -- call your agent of choice -- at $25,000, there is endless room to work with at 402 E. Jefferson Street! Inspections welcome at buyer(s) expense, but property being sold strictly "AS IS, WHERE IS." This realtor clearly cares about these older homes he is representing. His blurb is so well-stated that you can almost visualize the property before you see the photos. It shows interest in each of these homes and a desire for them to be cared for and useful again. Of course he wants to sell it, but there is more here than profit. I wasn’t putting down the agent. I was mentioning it was the same agent because it may save time for them in showing both homes to the same person. Please don’t think I saw it that way — I appreciated the connection again to the other house and his presentation of them. You find ways to widen our world every day, dear Kelly. Really?! Congratulations!! I’m glad this home finally found an owner. Some people are doing FB pages or blogs to track their progress, will you be doing the same? I’d love to see what you do to the place. Congratulations, Matt. The term “diamond in the rough” is overused but this once fine home truly is a diamond waiting to be polished into the beautiful Queen Anne she once was. I wouldn’t recommend removing the plaster but since that is already done, drywall will have to suffice. That pointed “Gothic” style door leaning against the fireplace opening is one of the neatest things in this house. Probably not original to the house but with some imagination, it would blend well with the eclectic Queen Anne decor. The fireplace opening probably once had a nice wood mantel which perhaps was stored somewhere or was regrettably sold at some time. Regional flea markets like the Extravaganza in Springfield, Ohio, often have decent salvage mantels for reasonable prices. The last time we visited, this mantel, which would work fine in this house, was available for $275 https://www.flickr.com/photos/11236515@N05/15602393832/sizes/k/ Thank you for caring about our architectural history and I wish you the best as you take on this project. The comments from the lady with the New York magazine could be of enormous help in reaching your goals. It’s takes courage to take on a big old house like yours with a very small budget. If you don’t soon win the lottery, I can only hope publicity will bring in some much needed funding. You should do a YouTube channel on the restoration. The proceeds will help in the costs and if you can make it interesting and informative (and not take endorsements) you might go viral. Unbelievable!!! My sister-in-law is originally from Mt. Pulaski. It’s a pretty small, sleepy community. I will forward this to her and see if she can get any interior photos. I can’t wait! would love to see some old photos of it and learn about its history! And WHAT is this square thing????? A landing pad for UFOs? It looks like this one may have started life as an italianate, complete with a cupola, which would explain the awkward square thing. The corbels are a giveaway, to me. That, and honestly, the footprint is relatively boxy and simple. The bays and tower could have been easily added later, in an extensive turn of the century remodel. That wasn’t uncommon. There was an older house on the lot before this one was built after 1893, but located farther south and not congruent. I’m sure there used to be cresting around that flat roof rivaling the finial on the tower for panache. The tower and gables have/had finials, and the gable peaks have cresting (which perhaps was once more elaborate as well), and that flat roof seems kind of empty without cresting of its own. Hell of a drum riser! Hello the flat area on the roof is the roof access and observation area. I’m sure it had spindles and handrail all the way around. Our house has one with iron spindles and is safe but not an everyday place. Great listing, although I want interior photographs! Such good exterior photos. I’m just at the far end of the country…. The platform on the roof has a hatch up there. Someone may have wanted a Widows Walk even though this town is totally landlocked. I would like to see the inside. Love the tower, love the corner lot a lot. Because some of the details match George F. Barber designs, I’ve emailed Chris DiMattei asking for his opinion. I’m fairly sure this originally ornate towered Queen Anne once had art glass windows (stained, leaded, beveled) now missing. Of course, the cement (asbestos?) shingle siding hides some of the original details. As others have suggested, I too think the flat roof platform once either had iron roof cresting or a wood balustrade strictly for ornamental or stylistic purposes. The one thing that bothers me considerably is the mention of the house having “been gutted in various areas”. If the reference pertains to the kitchen or bathroom(s) then probably not much to be worried about. However, in the important downstairs “public” rooms like the parlor, dining room, or foyer/hallway, that could be unfortunate. Did anyone notice the pointed Gothic window on the carriage house/garage? 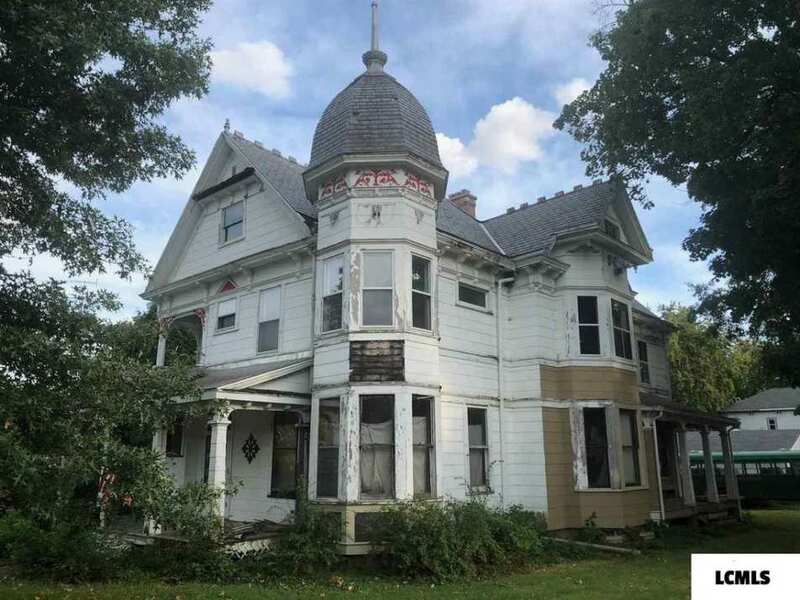 (streetview takes you right by the garage for extra views: https://goo.gl/maps/nc1M5k7HTpD2 ) Like the Lincoln, Illinois house, this former impressive Queen Anne will need significant work. Fully restored and repainted in period colors, the restored house would be a visual gift to the small community of Mount Pulaski. I did some minor streetview touring around town and no other period house I could find approached this level of grandeur. In summary, I think the low purchase price would go a long ways towards bringing this house back provided there’s an ample budget for the rest of the work. For heaven’s sake, I hope that no one buys it with the aim to finish the interior gut and create a bland modern interior. 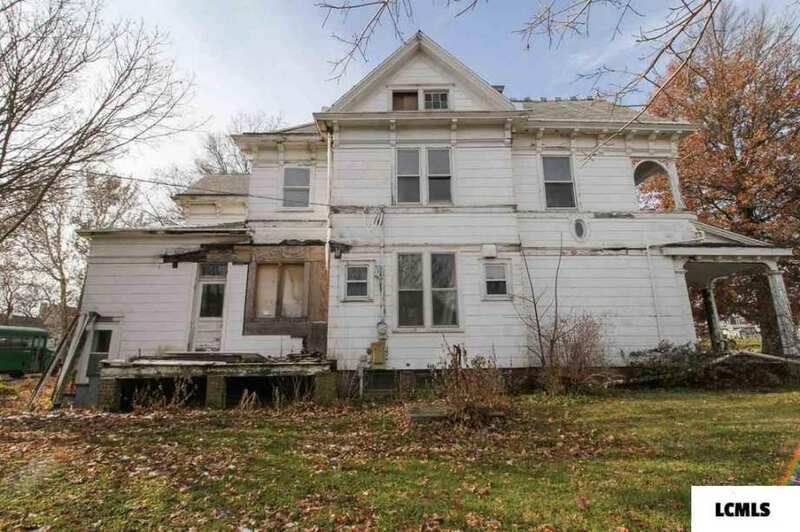 An ornate grand Belle like this house deserves a respectful, sensitive restoration. John, thanks for the heads-up on this one. I do also see the many Barber design similarities, in fact, it resembles several published designs. If only I could see some interior photos, I could look for clues there, as well as check the floor plan layout to see if it matches one specifically. I do agree that this is highly likely a Barber designed renovation to an existing, previously constructed home, as others have already indicated. I look forward to any interior photos that may be posted here in the future. In the meantime, I will continue to investigate this home further. I appreciate your opinion Chris. The portion of the house towards the back looks as though it could be older. As we know, Barber welcomed renovation projects to existing homes or even porch designs. If I lived closer, I’d make a trip to Mt. Pulaski and see if I could take a few interior photos. Perhaps someone living nearer will be able to do us a favor and take a few for us. Keeping my finger crossed that this is a Barber design but even more importantly, I hope it can survive to be restored so that it once again becomes the pride of the community. Not as bad as I thought it would be. It’s a 20k house so I was expecting worse. Added the new interior photos, moved to front page. The good news here is that this house could be restored to look much as it did originally. 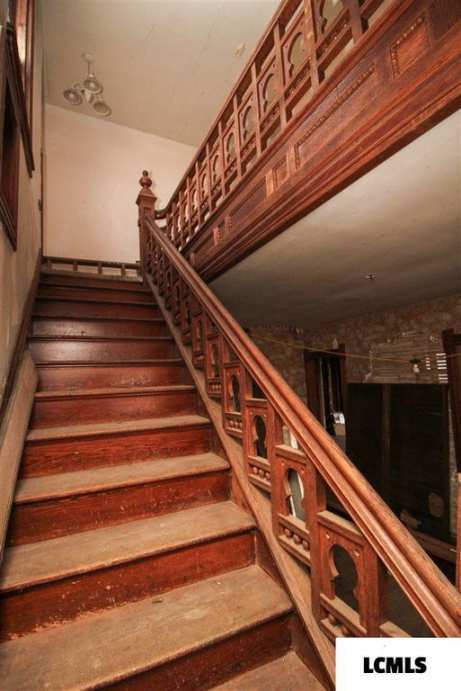 The pocket doors are still in their wall pockets; the ornate staircase remains intact; hardwood floors appear to remain. I don’t see wholesale old window replacement either. I think I saw a surviving mantel five photos from the bottom of the photo collection. There may have originally been art glass windows and/or interior fretwork, now missing. Of course, a lot of insulation and drywall (recommend blue/green board humidity resistant drywall skim coated over with an 1/8 inch finish plaster for a more period sensitive treatment) remain to be installed. 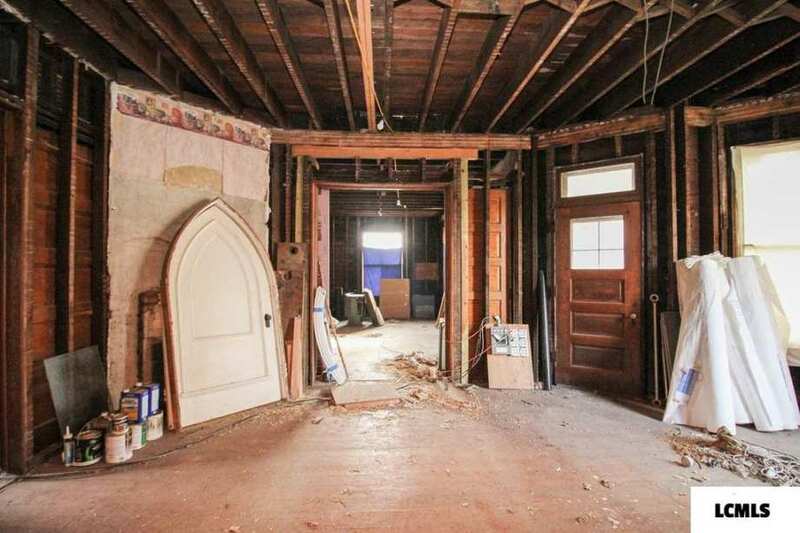 Remember, the asking price is only $20K so, for about the price of a new starter home potentially you could have a fine turn of the last century Queen Anne style Victorian house when all of the work is completed. 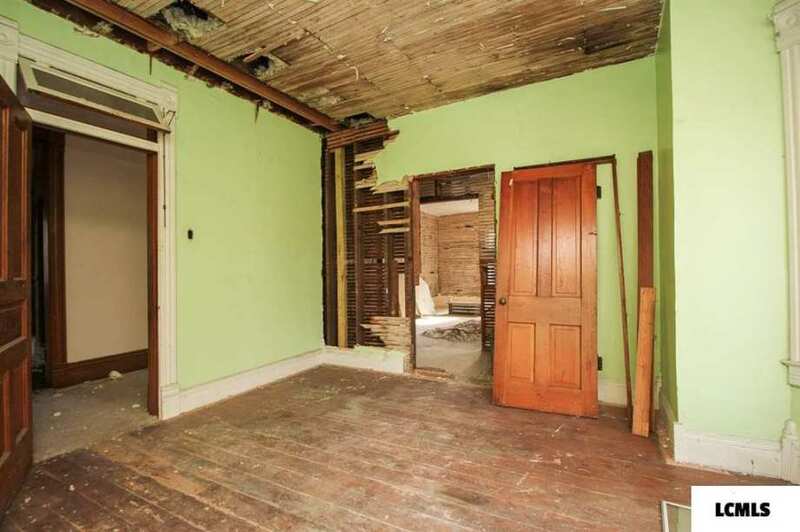 Last, this house also serves as a lesson in the perils of whole house gutting. 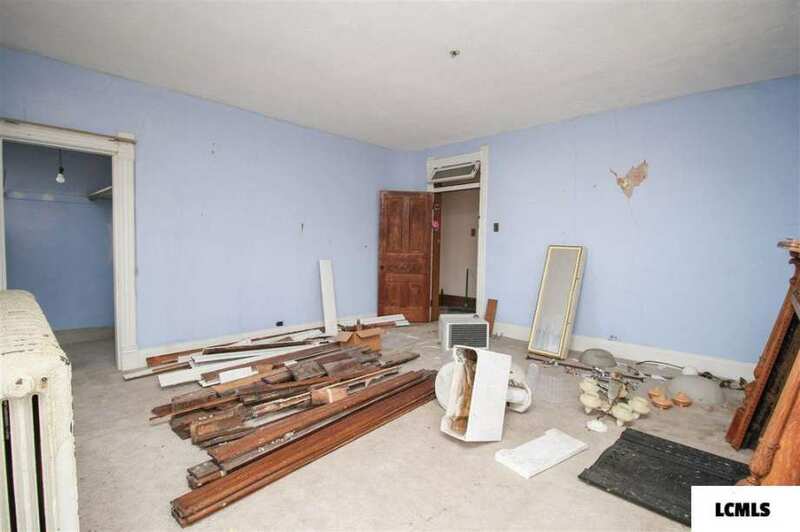 Better, in my humble opinion, to tackle one room at a time because when the entire house is in this partially demolished state, a lot of vision is required to see clearly what the finished results will look like. I’d also recommend for practicality to put down floor protective paper. Ramboard is one commercial product which holds up well to heavy foot traffic and demolition debris while protecting the flooring underneath. 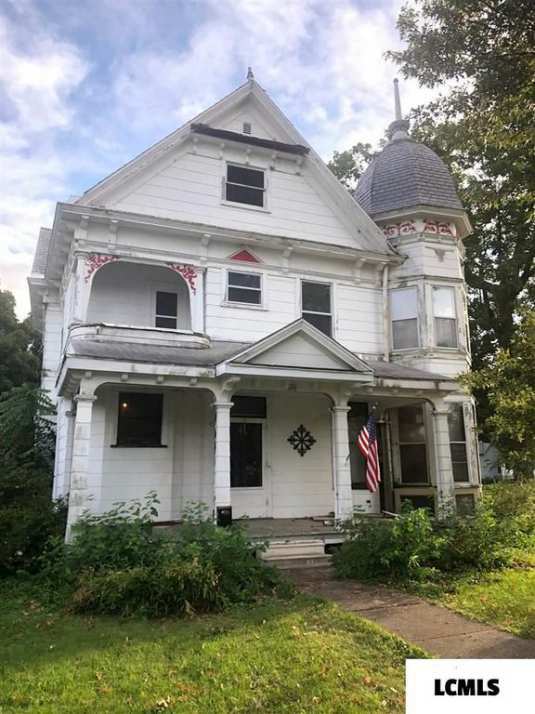 Although this project house may exceed the resources and capabilities of a first time restorer, it’s probably within the scope for someone with moderate experience in (properly and respectful) old house restoration. For the next owner(s), he/she/they should honor and respect the house by not trying to make it look like the modernized interior of the latest HGTV show. Kitchens and bathrooms are less important in keeping to period but even there, a stylistic nod towards the Victorian era helps to unify the personality of the house. Finally, I recall the carriage house in back has a Gothic style window above the entry. (streetview https://goo.gl/maps/nc1M5k7HTpD2 ) I see a Gothic style pointed arched door with surround leaning up against what must have been the parlor mantel. Perhaps it could be integrated into a rehab of the old carriage house or serve some other purpose. Good luck to the next owners. Well, Kelly, the house had me at the exterior. Yes, it looks a fright but everything I see is fixable. The loss of so much plaster though is lamentable. WHY do people do this???????? I am fully rewiring my 1894 house, have installed central AC, and am installing all new plumbing, while saving almost all the original plaster. The staircase in this house is alone worth it! Stunning! Fabulous! I would lose SO much weight because I would delight in just walking up/down a dozen times a day for no other reason than the delight! While much trim and doors have been removed, I was thrilled to see mantels and trim and doors all resting about upstairs. So, all the original bits MIGHT still be in the house. The neighborhood looks fine with a school across the street. The exterior would be a KNOCK-OUT with all the later siding removed and the whole painted in period-correct colors. AND that tower finial! AND that roof cresting! Oh my! Oh! How I would love to get my hands on this faded beauty! A true damsel in distress! And look what’s in the back yard! Well written, Ross! Thanks for everything you do to save old beauties like the Mt. Pulaski Queen Anne. I love this house and I love that so many readers read both Kelly’s blog and Ross’s blog. I so love John Shiflet’s and Ross’s detailed commentary and there is another gentleman who I enjoy reading who often talks about Sanborn maps and brings us a lot of history about each house. Here in New Rochelle we have many old homes (mostly old homes here) from the 1920s and 30s. 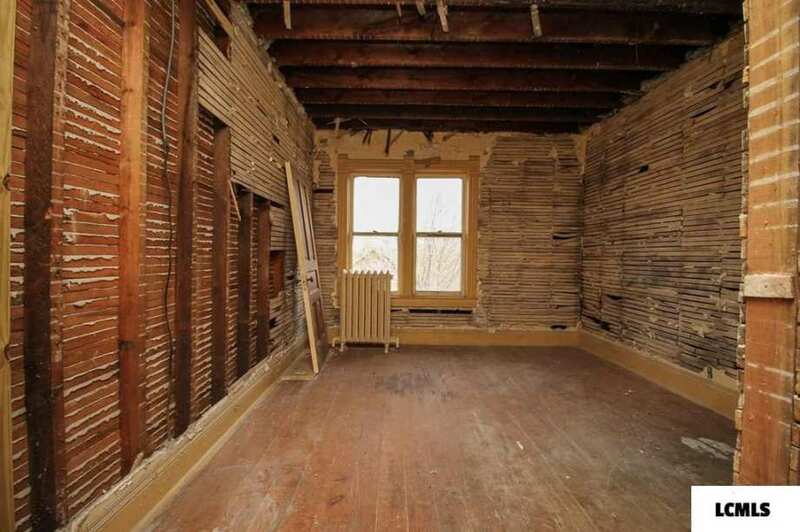 I have renovated/restored/maintained my 1923 house, but I would love to take on a project like this. I am handier than my husband, but I am no architect or expert. But I am a good project manager! I do hope someone buys this and restores it with love and respect. Good advice, Tom; I currently have 3 rooms of trim numbered and bundled together, hopefully it will all be back in place by spring. As you noted, it takes skill and patience to properly remove window, door, and base board trim from a room. Since trim was typically face nailed with finishing nails and then counter-sunk below the trim board surface, (then puttied over before shellac was brushed on) it’s best to use nail cutters to cut off the old nails flush with the wood on the trim board back side. If you try to hammer the countersunk finish nails out through the front they often emerge with a sizable chunk of wood around them. Better to reinstall by pre-drilling holes for new finish nails and then counter-sink them as was done in the original installation. Numbering or otherwise carefully marking trim boards to denote specific windows or doors saves a lot of time and head scratching. Bundling boards for specific locations is also a good practice. It doesn’t hurt to add pencil, ink marker, or chalk marks on the back of the board for “top”, “bottom”, or mark “R” for Right and “L” for left just to make sure everything goes back exactly as before. It’s also helpful to hold up a board and visually verify that the nail hole pattern matches the (cut off) nail stubs on the back of the board. On this house, a sort of trim board “triage” will have to be conducted but its almost inevitable that some pieces will be missing or otherwise damaged beyond the point where they can be reused. Hence my recommendation to seek out salvage sources for replacing missing or damaged items. In my experience, the best results always come from a deliberate methodical approach which is the antithesis of the kind of demolition seen done with wild abandon on the HGTV shows. It is closer to taking an archaeological or forensic approach to deconstruction than just ripping things out. (in other words, the opposite of replacing the old with new) In the best remove and put back practice, the finished result should not look like it was ever removed and put back. As aborted reno’s go, this one doesn’t appear to be too terrible. 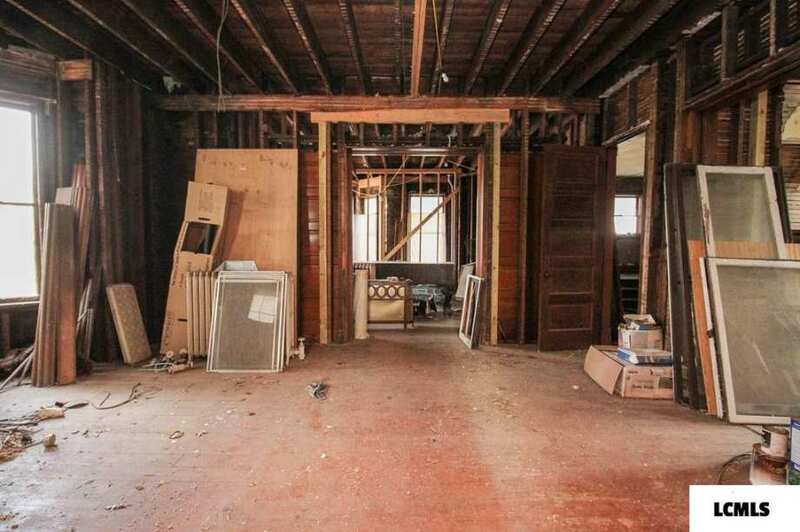 At a less than $20k list price, there seems to be some value here for a strong DIYer to compromise with drywall and install modern systems and end up with a dream house still full of historic value. I checked a couple Sanborns, as I was curious as to original porch design. There never was a wraparound front porch, and the build date was between 1893 and 1900. I hope this home find the right person to love and restore it again. It is a shame they gutted so much of the interior when they should have gone room by room, as John stated. Ross, I do like your enthusiasm! I hope the next owners have the same! Thank goodness most of the interior trim and millwork has been saved. Don’t mind seeing the old plaster removed, makes insulating easier. John, what a wonderful post. Your love and respect for these kind of property’s is an inspiration! I have lived in the US for 15 years and am in awe of the incredible Victorian housing stock here. Too many have been and are, being lost at an alarming rate. Homes of this quality will never be built again. I don’t know what your background is John but your posts are always insightful and educational. Thank you. Posting regional links to resources to help with the restoration?? Now that is just showing off!! lol! Thanks for the kind comments, Peter J.. You are right on the mark when it comes to the dilemma of continuing losses of our 19th century architectural heritage. You’re correct in that it would be almost impossible today to build houses of this quality. The construction lumber and millwork lumber of that era largely came from America’s old growth forests which were being depleted at an alarming rate in the final decades of the 19th century. Giant vertically integrated (definition: https://en.wikipedia.org/wiki/Vertical_integration ) house parts suppliers like Foster-Munger in Chicago even owned vast tracts of forests in Southern states to satisfy their insatiable need for wood products. By 1910, shortages in lumber supplies were common and the last of the old growth Pine forests were being cleared. Construction methodology was also different when this house was built as well. Even though the millwork was likely ordered from a catalog and shipped in by rail, carpenters still had to fit the doors, windows, mantels and staircases into the specified locations. Today’s contractors would be frustrated at the glacially slow pace of construction in the Victorian era. They did have (foot powered) table and scroll saws available but modern power (battery, electric, and air powered) tools have increased output exponentially. In summary, once these Victorian era homes are lost they will never be replaced with anything comparable. Too bad for them that historic preservation is not considered a priority by most local, state, and Federal entities. I’ve been involved with historic preservation and preservation construction/rehab since the 1980’s. In ancient times after graduation from college, I worked in mortgage banking and credit management before moving on to my true passion which is history and preservation. one, I hope the right person snaps it up! Some really great commentary on this project house and I definitely agree with many of them. From what we see in the pictures, the owner didn’t have a hard plan in place when the demolition was started. 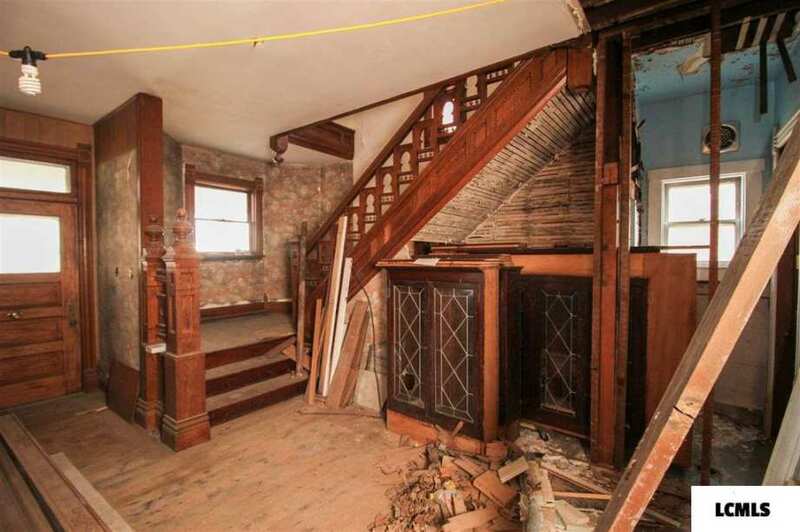 Anyone who buys this place and wants to rehab it has to deal with all the salvageable trim and other parts that can surely be reused. Its going to be a big puzzle for someone who lacks experience in restoration. Assuming the house survives and everything is ready to go for new wall covering I wanted to bring up a topic that hasn’t been discussed here. If drywall is applied to the existing studs, the existing base and assorted trims that was removed will come up short in many places. We are dealing with the difference in thickness between old plaster and new drywall, which means the room will actually grow by an inch plus and we have to come up with a way to compensate for Door jambs as well as window casing that will now stand proud of the new walls. A couple solutions are possible for the door jambs and the window casing which I don’t like. You can remove the jambs and window casing, disassemble and trim them to the thickness of the new walls or you can build up the back side of the face trim to rejoin the wall. Since the base will come up short on some walls, your only option is to have new base made which will be expensive. There is a partial solution; reuse all the old base that survived in the community rooms. New base can be made and installed in bedrooms and closets where it wouldn’t be noticeable. Many times bedrooms and other nonpublic rooms used a less expensive wood and sometimes painted which won’t help if you come up short of base, etc, in the main living area. One more solution is probably the best way to try and stay away from the above. You can shim the existing wall studs before installing new wall covering. This is a solution I have used in the past and it worked out well. This is time consuming but does eliminate many problems when you have to reinstall the existing trim. I know I put the emphasis on the base but many times we deal with other trim product such as crown moldings, picture molding and wains coating as an example. If anybody wants to know how we shim these walls I would be happy to explain in detail how we accomplish this to provide a very flat, straight wall that will look like the original plaster when finished. An easy fix is to nail strips of the old lath to the face of every stud. This is quick and easy. This normally works perfectly, with all the old trim fitting well. Or, one could also recreate the lost plaster/lath. The poor house!!! I will never understand how people can let these beauties fall into such states of disrepair. This house is so amazing… I hope the right person with a pure vision and enough money buys her and brings her back to life. What a treasure. Perhaps I am the outsider on this, but I think that removing the old plaster is simply destructive, and very expensive to repair. 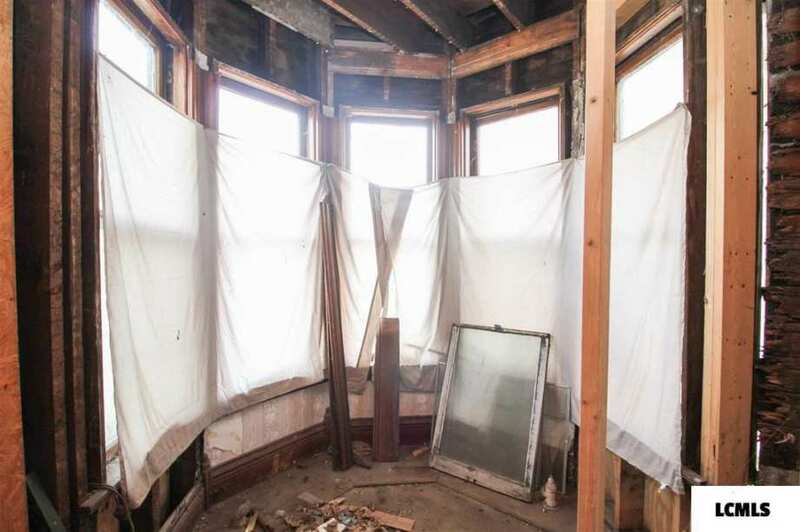 Even if you are removing plaster from the outside walls for insulation, and I do not believe this is necessary, there is no reason to strip interior walls. In fact I believe this approach will create serious problems in finishing the rooms, even if you have properly marked the woodwork. The solution offered by Ross and others, of furring out the studs using old laths to recreate the original plaster-lath wall covering thickness is a great solution. However, the original woodwork may still not fit against the new plaster board as it did against the plaster. The studs were not always identically sized, evenly positioned in an exact straight line, and the laths evenly applied. The original plaster craftsmen were astoundingly talented, and they could create impressively flat and consistent finished plaster even when the structure behind the final finish wasn’t level, truly vertical or flat. Thus even with furring, you may still have objectionable gaps between the original trim and the new plaster walls. Finally, even in homes with failing roofs and serious water infiltration, some fully derelict for years in inner city neighborhoods, I have not seen a single home where it was necessary to strip all the surviving plaster and lathing, and I have been actively involved in preservation for more than 40 years. Well said, Gregory. Those who are preservation minded, get it, although others may not. 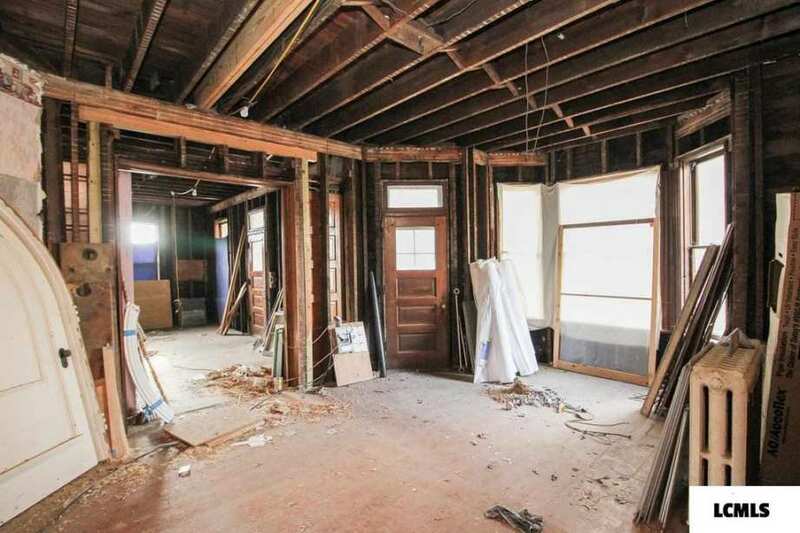 Most fixer upper type TV shows almost always show gutting and removing all of the plaster and lath no matter how good a shape the plaster may be in. Not surprisingly, many do-it-yourselfers accept that as the correct way to rehab an older house. The prevailing wisdom to justify such a drastic approach is that by opening up the walls allows for a closer inspection of the “bones” of the house and also makes conditions suitable for moving walls around, retrofitting plumbing and wiring as well as putting in extra insulation. Generally, complete old window replacement is considered another integral part of the project as well. However, as we know, old windows with slight improvements like inner storm windows can bring energy efficiency levels up very close to new high energy efficiency windows. Simply put, taking out all the old windows and replacing them with all new does not improve thermal efficiency enough to justify the high costs of wholesale replacement. 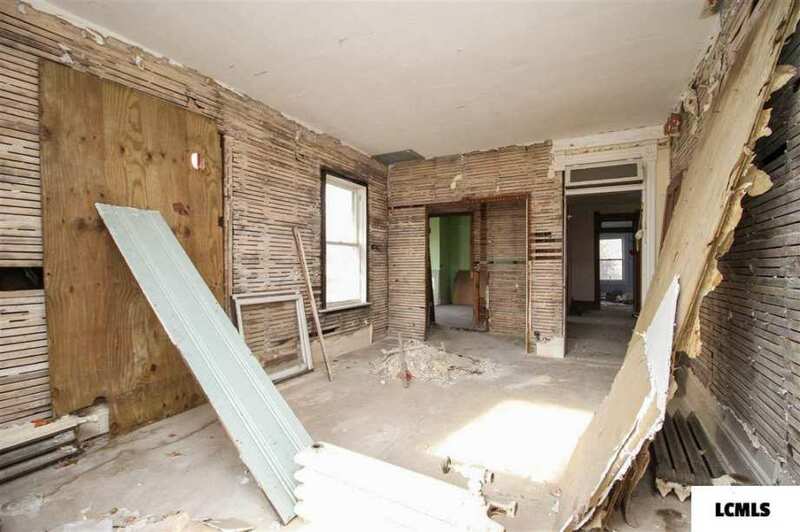 Non-professional trades people commonly take this standard destructive approach to old house rehab despite it being unnecessary in most cases. As for the Mt. Pulaski house, the next owner will have to work with what’s there. A reasonable facsimile of the original wall surfaces can be recreated and if the extra step of applying a thin plaster skim coat is performed, the result is very visually similar to the original plaster. While preservationists would love to see an original 3 coat plaster recovering the walls, the number of working plasterers who can do this kind of traditional work is fairly small. I’d also imagine the costs for a traditional 3-coat plaster wall (brown, scratch, and finish or neat plaster) would be a lot higher than drywall with tape and bedding. A lot of restoration work requires some compromises. Where plaster walls have a section of plaster missing but the lath is sound, an appropriate thickness of (blue board or green board for high moisture exposure) drywall can be cut to fit into the missing section then filled in around the patch margins. Proprietary products like Plaster Weld will help the adhesion between new drywall and old plaster, Where sections are loose, sometimes plaster washers (perforated metal discs with an anchor screw in the center) can be used to reattach loose plaster sections. None of this is rocket science but it does take some practice and understanding to master repairs of this kind. Now I guess I’m being preachy but if the worker is seeking to preserve the history inherent in the fabric of the old house, a respectful approach is best, IMO. One additional comment. Some salvage shops deal in stolen architectural fittings. Just take notice of how many empty historic buildings have been stripped of mantels and staircases. This is actually an international problem, but it is a crisis here in the United States. I have been present in shops when architectural fittings were purchased from people with very, very thin and entirely absurd explanations for them having the trim to sell. One of the dealers in Denver was caught stealing architectural trim there, and selling the stolen fittings in Kansas City, and selling his stolen Kansas City fittings in Denver. Even with proof, we couldn’t make anyone take this seriously. This is by no means a condemnation of all dealers, but please ask local preservation groups about a dealer’s reputation. All true, Gregory. When I lived in St. Joseph, MO in 2004-2006, I personally witnessed items disappearing from houses, Word got out among the criminal often drug addicted folks that not only could some money be made from stealing brass and copper plumbing and electrical wiring but also from architectural elements like stained glass and other art glass windows, mantels, newel posts and balustrades, antique hardware, and other decorative items. Since the city was only about an hour from Kansas City and about 135 miles from Omaha, NB, (as well as a number of regional flea markets and outlets) there was a black market for stolen architectural pieces. I don’t know how to fix the problem because if dealers refused to buy questionable items the thieves could still sell on Craigslist and e-Bay. 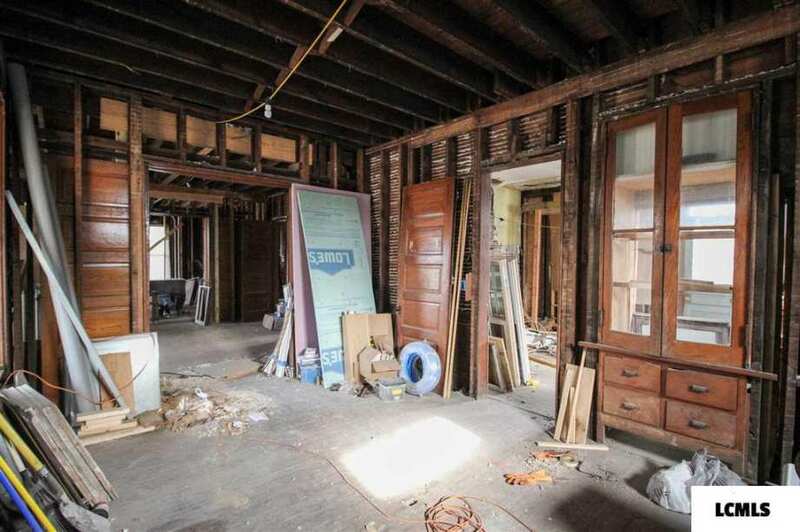 (and sometimes do) When demolitions take place, sometimes a fairly large amount of valuable salvage is not reclaimed due to laziness and apathy by the party paying for the demolition and the demolition contractor. (in many cases municipalities that have condemned a structure) As you mentioned, enforcement of salvage laws is lax. In Cincinnati, Ohio, there is actually a law on the books making it a crime to sell stolen stained glass windows yet it is almost never enforced. In recent years, there have been some gains in reducing the selling of illegally obtained scrap metals and wiring. I don’t have a lot of hope that the situation with stolen architectural items will improve anytime soon. The last time I was at a regional flea market I saw one dealer who apparently had removed ornamental iron fencing (small sections) with single gates strongly indicating they came from cemetery grave enclosures. If thieves have so little respect for the dead, small wonder they have no respect for old houses and buildings so long as there’s a buck or two to be made. Thank you John for the comments on windows and salvage. Denver lost a house with Tiffany designed interiors because strippers hit it the night of closing, and the preservation buyer backed out. Just a quick, sad-funny story from Kennebunk, Maine. Less than 24 hours from demolition, two friends and I found a hero to save Wallingford House, a spectacular Federal style mansion on Route One. It survives with a real ballroom, wonderful staircase and mantles, and its original mahogany grained woodwork with painted satinwood inlay intact. There is also a full set of Defour et Leroy scenic wall paper hung about 1812. Anyway, the new owner had the original windows and their interior shutters restored. As our master carpenter was finishing the second floor sash, a salesman wandered in an open door. He looked at the pile of restored windows, and said we were crazy. He could sell us nice new windows that didn’t need any work. He could remove the old shutters so they weren’t in the way, and install brand new windows. He’d even throw in wider outside trim boards to cover the gaps where the new windows were (a lot) smaller than the old ones. Maybe, he added, we’d be interested in new maintenance-free vinyl siding? Our carpenter gave a terrible yell, grabbed up scrap wood, and chased him all the way to his car, throwing bits of 2″ x 4″ at him as he ran. I wish I’d had a camera…. I can summarize the mindset of the window and siding salesman in one word: Philistine. (in the Victorian Aesthetic sense) That said, I’m sure there are equally clueless homeowners who might have welcomed the salesman’s pitches. I’ve been through historic neighborhoods where over 90% of the houses had substitute/artificial siding as well as modern replacement windows from the local big box home improvement center that were mismatched with the original window sizes and styles. Unfortunately, I don’t know how to fix stupid. Enough said. A previous commenter hit the nail on the head in stating that this home can (and WILL) be a show stopper. There’s so much to love! If ever an old home deserves the loving, caring royal treatment, this IS the home. I have fingers crossed that this lady will find her champions. Godspeed to you! One more observation (which I should have mentioned a while back) and what other readers observed is the genuine care that the agent for this listing has clearly expressed. This agent cares about this home, He sees what we see (a gorgeous old home in need) and he is working hard to sell it. I’m on his side; we want to find the next great caretaker of this fabulous home. This guy sees it; why doesn’t anyone else? For someone out there, this is your dream house. I hope YOU, dream house guy, are reading this. Here’s your house!